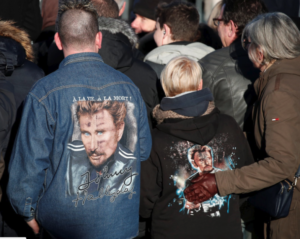 Johnny Hallyday was a giant rock star in France, and would show up in all sorts of French films I’ve seen over the years. Whether the movie be commercial cheese or popular entertainment, Hallyday’s presence was always electric. This guy was a real rock star. Not that I ever listened to his albums. Like Elvis Presley, I got the sense he had some great songs, but he also recorded a lot of shlock, all the more so for the movies. So, incredible aura, but very little consideration as an artist. And this seems to be the case all over the English speaking world. But in France? He died this week and they threw him a rock star’s funeral. Dig all the pictures here. This entry was posted in obit. Bookmark the permalink.